eBooks as digital products are a very hard medium to maintain proprietary control over from the perspective of the writer/owner – especially when it comes to people sharing a single copy repeatedly for free. An ebook PDF file is not like a piece of software where you can build-in special license activation codes or other restrictions. There is however one fairly simple way you can protect your ebook business assets by discouraging your customers from unfairly disseminating your book to large numbers of people for free. 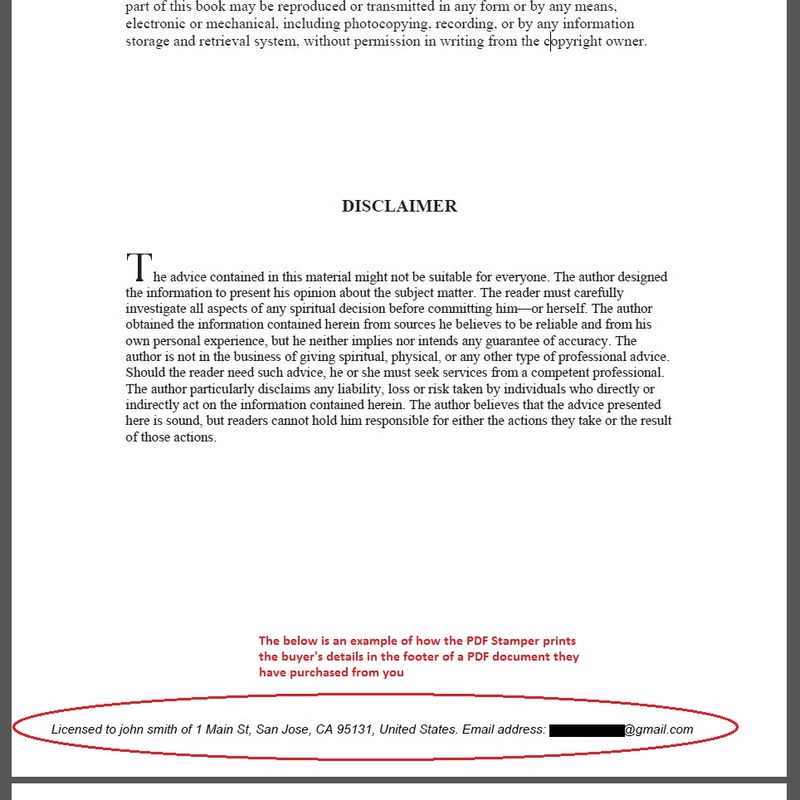 I am speaking of a handy plugin called WP PDF Stamper. By having such personal details as their email address and even residential address on every page of the book, most people will think twice before they decide to irresponsibly give the book to every man and his dog on the internet. This plugin has a few useful features which make it rather flexible for people with different needs and eCommerce setups. If you like to sell products using a plain PayPal button then this plugin will easily integrate with your current setup. The integration is fairly simple and involves including a couple of pieces of information in your PayPal button code. The two bits of info you will need to add to the button code include a reference to the special IPN handling script which comes with the PDF Stamper plugin and the download URL of of your ebook. This plugin also caters for the cases where you wish to sell your ClickBank eBook products from your WordPress site. The beauty of this is that although your customers will be paying through the ClickBank payment system, the plugin will automatically stamp the eBook with their details before they receive it. The integration involves specifying your PDF products in a special script file provided by the plugin and also using a shortcode which will facilitate the stamping of the file and sending of an email with the download link for the stamped file to your customers. If you use WooCommerce as your selling platform then you’ll be pleased to know that the integration with the PDF Stamper plugin is very easy and involves enabling a checkbox in the settings page. – copying of text or graphics in the file: you can enable/disable the ability of people to select and copy text or graphics from your eBook. – modification of the file via Acrobat suite: you can enable/disable the ability of people who use the full Acrobat suite of products to modify your eBook. The WP PDF Stamper plugin gives you a number of configurable options regarding the layout and location of the footer text and also the font style (bold/italic/underlined). The plugin’s main strength is that it is designed to use the customer’s purchase details to automatically stamp this information in the ebook. Another handy feature is that you can manually stamp any text to the pdf file of your choosing. If you currently already use WP eStore as your eCommerce platform then integration is amazingly seamless between these two plugins. 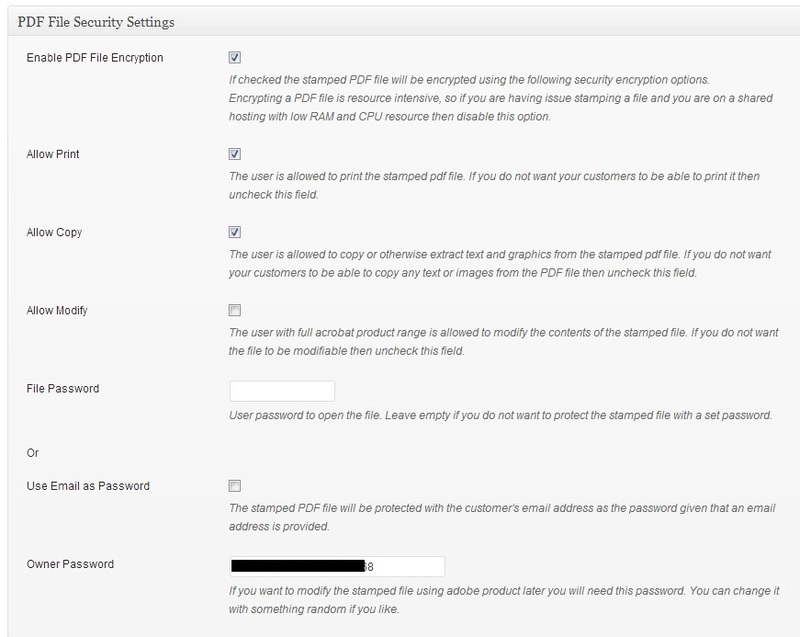 All that you need to do is to check a flag in the eStore product configuration page which will enable stamping of the pdf file. So if your online business involves the production and sale of PDF eBooks why not add that extra piece of mind to the protection of your products by using the WP PDF Stamper plugin.